New to airbrushing, sculpting and this community! - looking for some tips on how to layer up colors for an albino-esque skin tone & veining? Have gathered up a ton of references (https://www.pinterest.com/adahlia/creature-project-inspiration/ ) but just not sure where to start and feeling a bit paralyzed. My base color is a creamy-milky white with touch of yellow & red. 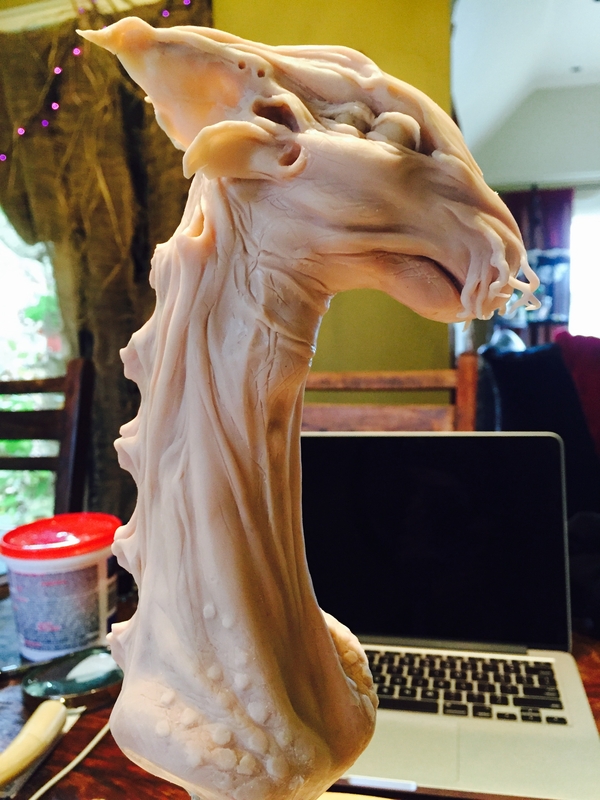 Below is my finished sculpt (before paint). Hey Lisa, Great looking sculpt! Realistic skin is all about transparency. Assuming you're using sculpy you'll probably want to go with acrylic inks and water/isopropyl alcohol to thin it way down when you airbrush. The sculpy is already pretty transparent so even with your base you'll want to go thin to keep that beautiful quality of light shining through the ears. I try to look at my own skin and think of the order and texture of colors. For instance the veins are under the skin so I should paint those first at sightly brighter hue to accommodate for the other colors dulling it down. Albino seems to have less red pigment (warmth). I'd suggest taking some time to do some color samples and practice on some toned paper (base color). I'm bad at this cuz I'm so excited to paint I want to jump right in. But, working with a plan makes for more professional looking pieces and allows for errors without messing up the piece. Here's a mixing demo on YouTube, he's using silicone paint but color mixing is more or less the same. I had started with Casey Love's sculpey series for the sculpt/paint and have Steve Wang's lessons bookmarked for when my subscription restarts in a couple days. Hopefully that'll give me some confidence to move forward on this! The initial mottling colors are what I'm puzzling on the most. Looking forward to learning more from this site. Amazing resource! The key, as blake mentioned, is translucency. I would use very washy mixes of color and build colors up slowly over time. The colors that appear in an albino often depend on the species of creatures. Many albino snakes have a yellowish color, while some subterranean albino rodents (like the albino naked mole rat) end up with more pink tones. If I were doing something like a mole rat I would start with a warmer base color and lay in washes of lighter pale skin tones on top of it in various breakup patterns to create depth and variation in tone. At some point in the process I would paint in some feint blue veins and layer skin tones on top of them to make them appear to be under the surface. For your creature I would make areas like the ears, nose, nose tentacles, and around the eyes and mouth the warmest, since that is where the most capillaries and blood would be. Bony parts like the forehead, cheek bone, orbital ridge, etc would all be much lighter pale. I suggest finding as much reference as you can of animals that are similar to your creature (albino or otherwise) and then think about how albinism might impact that character's skin, hair, and eyes. Best of luck! I look forward to seeing what you come up with. I got so caught up in the albino paint scheme that I forgot to mention how awesome your sculpt and character design are. I really dig it!